With all the storms this month, what better way to end September than with a storm of color? 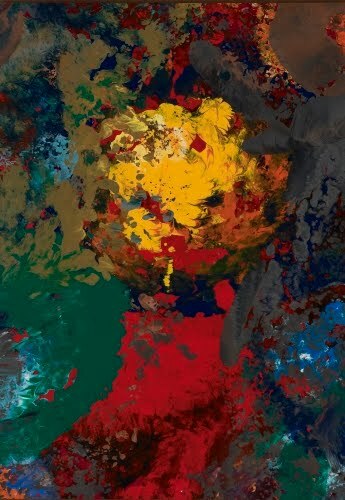 And what better way to end with color than to show you the work of an artist who is 1) committed to his modernist vision in painting, and 2) committed to extending an unpretentious appreciation of modernism to whomever wants to share it with him. I wish every town had an artist like Charles Clough with his open studio/participatory events. I just can’t stop looking at these paintings by Buffalo artist Charles Clough. 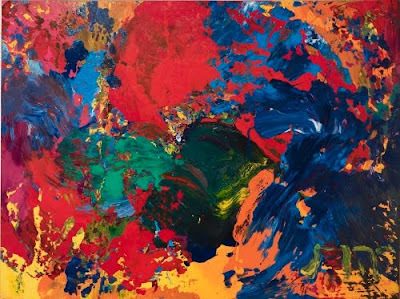 As early as the late 1970s, he was producing paintings that have been celebrations of color and gesture, and I absolutely love them. 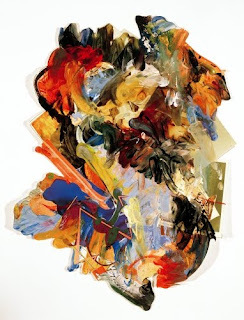 I am venturing a guess that he decided on abstraction rather than narrative content around 1980, based on the moment he writes about in his autobiography, Pepfog Cluff (2007). In his book, he states that he wanted to paint for process’s sake like Jackson Pollock (1912–1956). I can totally see a Pollock aesthetic in his work, although uniquely Clough. What interests me even more is that Clough’s work was featured in an exhibition called The Pictures Generation in 2009 at the Metropolitan Museum of Art in New York. It ostensibly featured artists who were involved with appropriated imagery like Sherrie Levine, Robert Longo, Jack Goldstein, and Cindy Sherman, but also, I guess, included artists who appropriated processes in abstraction. The exhibition included artists who founded the Hallwalls Contemporary Art Center exhibits in Buffalo in the 1970s, which Clough co-founded with Robert Longo and Cindy Sherman in 1974. Clough was born and raised in Buffalo, studied at Pratt Institute in Brooklyn (1965–1970) and Ontario College of Art (1971–1972). He also studied at the University of Buffalo Center for Media Studies (1973–1974) and New York University Information Technologies Institute (1997–1998). He has taught at Columbia University and the Rhode Island Institute of Design. He decided to devote himself to being an artist in 1971. I cannot say enough about how much I admire the diversity of this artist and his body of work. I admire him even more for his open studios called Clufffalo in East Aurora, NY, where total strangers are invited to lend their efforts to collaborative paintings. After you read about Clufffalo, you’ll understand why I said I wish there were artists like Clough in every town! You're so welcome. I'm kicking myself for not featuring you before this!